Welcome to Oregon Coast Retreat, located in South Beach, just south of Newport! This beautiful two story home has three bedrooms and three bathrooms and offers an oceanfront view of the Pacific from it's spacious backyard, all with enough room for up to eight guests! Step inside and you'll instantly feel right at home here! The living room and the kitchen are in close quarters of each other, making this an ideal and warm place to hang out together with everyone in your group! From the bay windows, you'll have a beautiful view of the water where you can watch the waves roll in or watch a sunset during the warm summer months. You'll also have quick and easy access to the back deck through the sliding glass doors. A large flat screen TV sits over the fireplace, where you can relax and enjoy a movie with your loved ones before bed or during an Oregon coast storm. The fully stocked kitchen is entirely modern, so you can whip up any meal your heart desires, or just throw together some takeout and enjoy it at the dining room table and the breakfast bar. Oregon Coast Retreat also has a washer and dryer available for guest use, so feel free to pack lightly and wash your clothes while here on your stay! An extra family area is available at this home, perfect for the kids to hang out in and watch their own kid friendly movie while the adults relax with something else! Head outside and you'll find a hot tub, perfect for both the winter and summer months! The master bathroom offers a jetted jacuzzi tub, a stand in shower, with his and hers sinks. The second bathroom has a shower/tub combo. Each bedroom will have you feeling right at home, with big and spacious beds! One of the bedrooms even has a pull out trundle, making this room perfect for the kids to sleep in all together while the adults get their own space! You'll be within close proximity to plenty of restaurants and things to do while staying at Oregon Coast Retreat! The Yaquina Bay Bridge is just a short drive north of here, and there are several restaurants and things to do in the city of Newport. You'll also be close to a Wal-Mart and Fred Meyer, just in case you forgot anything from home and need to make a quick stop at the grocery store! Book your stay at Oregon Coast Retreat with Oregon Beach Vacations today! Please note: Cooking Crab on the premises is not allowed. "What a great house, the view is amazing!!!! We saw whales all weekend long. Cell service is spotty." "This property is exactly as described. Great location and an easy trail to the beach. Great whale watching right from the windows. The kitchen is very well stocked with appliances and dishes. The place could have been a little cleaner but overall a great vacation place." "Had a wonderful time and enjoyed the view!" "The house was very nice and extremely comfortable. The view was incredible! Loved walking on the beach and watching for whales." "This was the perfect place to stay when visiting family in corvallis (All hotel in Corvallis were booked). It was an easy and beautiful hour drive, and so perfect to come back to this house and relax and watch the ocean! " The Most Restful Vacation in Years! "This house is beautiful inside and out. The view is spectacular. The path down to the beach is not far from the house. The beach is relaxing and if you enjoy geology, the rocks and cliffs are wonderful to study. The kitchen truly has basically everything you could want to use to cook/bake with. The counters in the bathroom are a bit on the tall side, as are the cupboards in the kitchen, so if you are even of average height, you may find this a bit awkward, but it's worth it. There are numerous jigsaw puzzles, the foosball table repeatedly kept my family entertained, and we didn't even touch the huge variety of DVDs. I'd love to return here again!" "This house was beyond what we expected in every way. Definitely want to return!" "Great views. Well stocked kitchen. Comfortable beds. Dvd’s and games. Short walk to beach. Very large MBR. Two living areas. It was perfect for six people. I wish we had had more than two nights there." "Efficiently laid out to accommodate two groups. Management very responsive. Easy access to endless beach. Close to Newport. " "The most relaxing vacation ever. We all really enjoyed our vacation and if I could, I would come every year!!! Thank you." "The home was beautiful and the view spectacular. Home was well-appointed with all one would need for a stay. Those were the good points. The rooms set up, although the information states "sleeps 8" would most comfortably sleep two adult couples in the master suites and 2-4 children in the room with the twin beds and trundle beds. Beach access was not possible as the trail was engulfed in a swamp. Cell service was only one bar and we had difficulty calling the rental office. The instructions for how to operate the tv, dvd player and other electronics were outdated; we were never able to play DVD's in any of the players. Those were the sticky points. Some messages were answered promptly by the rental agency; one was not. As I said, it was a lovely house with a great view and good amenities. " 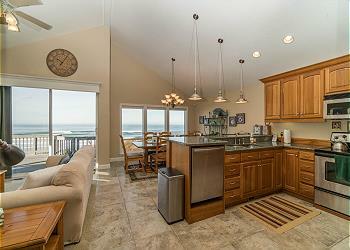 "The Oregon Coast Retreat rental was excellent. Location right on the beach with a fantastic view of the Ocean. Rooms were clean, all the amenities were available for a comfortable stay. Wish I didn't have to leave." "All our expectations were met, ocean view and the house itself are delightful. We will be back..."